Are Queensland voters different from those in the rest of Australia, then? Probably not, because Australians expect things from their governments – things like a social security net, infrastructure, sound management of the economy, respect for freedoms but concern for fairness and social justice, and high-quality education and health services to give everyone a shot at living the way they would like to. Both Campbell Newman’s spectacular downfall and Tony Abbott’s woes suggest that these values are not ephemeral but fundamental, and that voters will punish politicians who claim to uphold them but lie about that, and who embark on the dismantling of the state and the public sphere while indulging themselves in ideological fantasies and retributive wars on their opponents, real or imaginary. Newman governed as Abbott would have liked to had he not been blocked by the Senate. What is interesting is that the Australian electorate is becoming more like the Queensland electorate has long been – relatively unattached to party and ideology, and prepared to embrace alternatives where they present themselves. He wants to make Australia the science, technology and start-up capital of the region, with 3% of GDP spent on R&D within 10 years. He has identified a critical gap in the teaching of science, technology and design in our schools. two out of every five science and maths teachers for years 7 to 10, don’t have a degree in these subjects. 20,000 teachers in our science, maths and IT classes didn’t study these subjects at university. He promises to remedy this situation, along with a $500 million Smart Investment Fund. How he intends to fund the new vision splendid while doing something about bracket creep and looking to reduce the small company tax rate by five percentage point to 25% is far from clear. He points to labor’s concrete plans in the area of superannuation and international tax shifting. It’s a fair bet that negative gearing and dividend imputation are on the table. Whatever the reaction to the second Hockey budget and the Shorten reply, it is one skirmish along the way. Abbott has tax reform as a major agenda item along with a new look at federation and the relationship with the states. 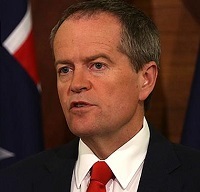 Shorten has, I think, a coherent vision that he needs to show how he will fund. Abbott’s vision as still a work in progress, with, I suspect, serious internal contradictions in the party room thinking – a contradiction between an active and enabling government and a pared down minimalist vision where individuals take responsibility for their own welfare, a contradiction between central and devolved government. There are some real nasties in the Abbott budget, like the withdrawal of support for community health services. Abbott needs time to work towards a coherent vision and consequent plan. Shorten is right in saying we have a cosmetic job at present, an attempt at a makeover without knowing what the final look is supposed to be. Unless the opinion polls swing heavily Abbott’s way I can’t see him going for a double dissolution. He needs time. Whether Abbott has the leadership skills to achieve coherence, however, is highly questionable. Labor has a better chance if Abbott stays because the vision will always show divisions and faultlines with Abbott in charge. Elsewhere Ben Eltham has done a detailed list of budget highlights and lowlights by portfolio. Update: The ABC answers 11 questions you need to know to understand the budget. The ABC answers 11 questions you need to know to understand the budget. Shorty is a BIG tax cutter, Yay ! The LNP has flipped ( regrettably ) so ALP flipped in responce causing the media to flip to ALPs aid. Pick the fiscal conservative game, all want the title, 1 is blocked by the other. Rinse and repeat at every election. Jumpy, I don’t know what bit of the ABC you’ve been hearing, watching or reading. Leigh Sales carried on like a brainless pork chop in both interviews. Bill didn’t promise to cut taxes apart from small companies. There seems to be some evidence (Laura Tingle and especially Bernard Keane) that Hockey didn’t have all that much to do with the budget. After all he spent a fair bit of time at ICAC and fitted in an overseas trip during the last couple of weeks. More Abbott, Scott Morrison and Mathias Cormann, I suspect. I gather Sinodinos was also involved in the budget too. Shortens was written as a reply and not an alternative, and it shows. He takes the most popular measure and pretends he will trump it. He attacks the quality of teachers (which is a State responsibility anyway ) and the Union is predictably quite, presumably because he’s somehow paying their hecs debts with a black hole. A bit of nonsense about compulsory coding lessons and lots of bla bla bla fake concern and confected outrage. To me both budget and reply were rubbish when it comes to our economy and addressing debt. But our Senate doesn’t want what the voters want. Jumpy, I agree about Leigh Sales, I’ll let the rest go through to the keeper. You seem to be saying that the Senate is ignoring the wishes of the voters who voted for them, which implies the Government, whose budget you (a voter?) consider rubbish with regards to debt, wants what the voters want. Do the majority of Australians want less Federal debt ? Do they want to stop paying $1,000,000,000 / month in interest ? Senators aren’t directly elected, as you should well know, they get a quota on a party platform. 1 Both houses conservative = less debt. 2 Houses split = Debt increase. 3 Both houses socialist = bigger debt increase. Jumpy, Hockey increased the deficit from $17 billion last year to $35 billion this year. Swan, working with the figures Treasury gave him, had the deficit coming into surplus in 2016-17. We know in retrospect that revenue would have fallen in a hole, but this was not clear at the time. Hockey’s budget shows scarce concern about debt and deficits. Unfortunately I can’t quote chapter and verse, but my historian friend has often pointed out that federal debt blows out under Coalition treasurers and is reduced when ALP treasurers work the levers. I don’t care enough to do the research. And to answer your question, I think most Australians know that our Federal debt as a proportion of GDP is one of the best in the OECD (if they think of it at all). And of course if they think of it at all, they will realise that Smokin’ Joe has managed to increase (double?) that monthly interest bill. my historian friend has often pointed out that federal debt blows out under Coalition treasurers and is reduced when ALP treasurers work the levers. Ahahahahahaaa, he/she lied to you, maybe you should reassess your” friend ” definition. I don’t care enough to do the research. Debt to GDP is a BS measurement aimed to distract from hard, solid total amount, this is obvious. The actual ” Gross Domestic Produce ” is unknown, thus the much hyped equation is useless. What of the GDP of the black market when economies go south ? Brian, I doen’t believe Wayne nor Joe nor the next Treasurer will see a surplus. I’m still happy that most of us want a surplus. The Senate won’t allow that or even some action to reduce spending. “Of the 17 top surveyed IMF countries, Labor left us with the fastest growth in spending of anyone in the world… and they left us with the third highest growth in debt of anyone in the top 17,” Mr Hockey told RN Breakfast on March 6. ABC Fact Check investigates Mr Hockey’s claims about Australia’s level of spending and debt. Hockey wants to reduce federal debt by blowing out private debt, hence his exhortation for consumers and businesses to start spending. This is apparently based on the typical belief in conservative voodoo cult quarters that government debt is naughty while private debt is sugar and spice and all things nice. Private debt is massive compared to public debt and the interest rates are much higher. Of course, provided it doesn’t cause inflation to blow out, the federal government can safely extinguish a large chunk of its debt by resorting to the printing press. Moreover, by historical standards Australian Government debt is small. Personally I agree with the old Keynesian formulation; rack up government debt when the private sector is growing slowly then hit the brakes when private sector is growing quickly. Jumpy’s claim that GDP doesn’t matter is obviously false and presumably based on a voodoo understanding of economics. Australia’s state of play would be vastly different if we had the GDP of a minimal government paradise like Somalia, which at the moment amounts to a few hundred sea-shells, a couple of shekels, one goat, one well-used copy of Atlas Shrugged and three wives for sale. You’re quoting the ABC??? That pack of can’t-trust-a-word-they-say greeny socialist liars??? We must have slipped into a parallel universe. Jumpy, zoot, Greg Jericho’s piece has a graph of historic net debt. zoot, I think your friend is going back a long way, perhaps to Bob Menzies, who left debt at 41% of GDP. It matters what you spend it on. Menzies was nation-building. Costello pissed the surplus up against the wall with middle class welfare and tax cuts. Swan started to spend money on infrastructure, which Costello neglected. There is an argument put by some economists now that we should borrow big while interests are low to modernise our infrastructure. You know, stuff like the NBN. Given our low debt to GDP ratio catching up on our infrastructure needs right now makes good sense. We can all point the disasters caused in the Weimar republic and Zimbabwe fro excessive use of the money presses. On the other hand, we have seen that the responsible use of the printing press has helped bring the US out of an economic crisis while boosting their competitiveness by reducing the value of their currency to our disadvantage. The EU is now following the US example. I think that a case can be made now for Australia to follow the US example at least to the point where the value of vs the $US gets back into the normal range of 50 to 75 cents. The RBA fiddling with interest rates has demonstrated once again that there are limits to what can be achieved by lowering interest rates when the problem facing the economy is a shortage of customers rather than investors and the customers are not borrowing to pay for consumables because of job and business insecurity. You see what Jumpy did there? At 2:00pm on May 16 I commented on Jumpy’s strange logic regarding Australia’s form of representative government. Here we are, a day later and Jumpy’s made it all about debt. And yes Brian, my friend may be stuck in the past – I did say historian 🙂 I’ll check the next time we meet. Watcha think of the small business tax cuts, too big, too small, just right? Or just pick another one, I’m all ears. On the other, if the concession is used to help buy a new bigger, gas guzzling ute then car importers may make a bit more money but the planet may be a little bit worse off. Worse still, if the concession is used to buy a new piece of equipment that will allow a business to reduce the number of employees this will be a loss to the country. My take is that we would have been better off if the money had been used to increase the demand for Australian goods and services. Ambigulous on Final chapter on Adani? Brian on Final chapter on Adani?